The world 2 point O (2.0) is upon us. The 2.0 buzzword, used to characterize the diffusion of technology and social media into traditional markets, is permeating every industry and vertical on the planet. 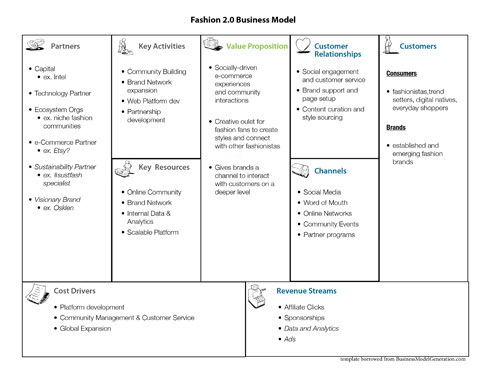 One industry in particular, fashion, is starting to see profound effects as a result of this shift, which is why in this edition of Business Model Breakdown we are going to analyze Fashion 2.0. Around the world, the movement has begun to create open and borderless markets powered by social connections. It’s what we call ‘the collaborative economy.’ With technology as the enabling factor, enterprises are becoming empowered to efficiently develop and mobilize the people and resources they need to make their mark. That’s how the world 2.0 is happening. But what’s behind this movement? Beyond the impulse to create enterprises and ecosystems that are social, the real reason is rooted in the desire for democratization. Tired of watching big brands and multinationals dictate the rules of engagement, global communities are mobilizing to develop open, transparent markets and shift the focus from consumption to creation. And no other industry in the world fits this profile more closely than fashion. With hordes of heritage and fast-fashion brands driving the style agenda, the emphasis has shifted from creativity and natural beauty to profitability and manufactured looks. Now, consumers and designers alike are collaborating to counter the trend and bring fashion back to its roots. While some focus on the technology side of Fashion 2.0, we are going to focus on the social side: user-generated content, co-created fashion lines, community lookbooks, these are just a few examples of how Fashion 2.0 is evolving from this perspective. Rather than the brands defining the content and setting the style bar, what if the customers themselves began to write, record and create the content about the brands they love and the looks they roll with. And not just on their own personal blogs, but on the brand’s site itself. 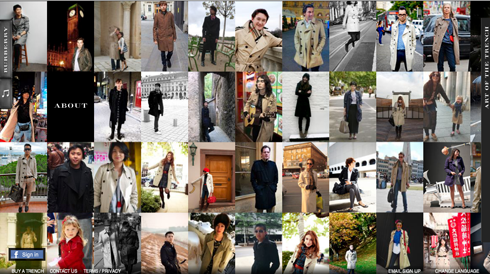 Burberry developed Art of the Trench, which shows photos of customers rocking the iconic Burberry trenchcoat. While some photos are specifically commissioned by Burberry, others are uploaded by customers themselves; users can vote and comment on their favorite photos and share with their networks. As a strategy for brands to sell their wares, they create lookbooks, visual collections of selected garments that help customers visualize new clothing lines as part of a look. Naturally though, many customers have their own version of how the new clothes could be combined, and not all of them will be from the same brand. So people have started creating community lookbooks, customized versions created by users and voted on by the community. 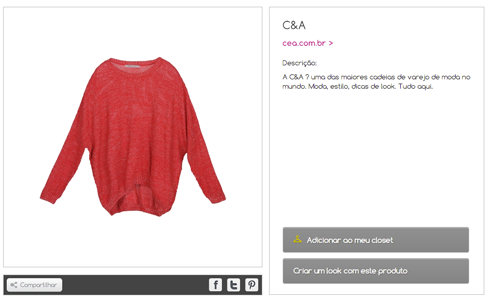 The Brazilian website, Fashion.me, was created for just that reason. On the site, which blew past more than a million users last year, users can create their own lookbooks from an assortment of brands, vote and comment on other lookbooks, and connect with community members. Since forever, major fashion houses have brought in sought-after designers from the top fashion schools to design their new collections. But those who attend those establishments represent only a tiny fraction of the collective design talent out there. That’s why brands are starting to tap into that latent talent by integrating their customers into the design process (co-creation). Mod Cloth, an online women’s clothing store specializing in vintage and retro, recently completed their ‘Make the Cut’ competition where users submitted designs for an upcoming collection and the community voted on it. Now that the winning design has been selected, the next step will be put into into production and sell it on the company’s website. While that all sounds cool and exciting, the question is, where is the business model in all this? Beyond just a branding tool for fashion houses, communities and shopping portals are being created to create socially-driven experiences. Rather than just click and buy, users are immersing themselves in the content, interacting with the community and expressing their tastes through their own creations. It’s evolving from the traditional one-way, you-buy-we-sell experience, towards an open-ended ecosystem where anyone can buy, anyone can design and anyone can sell. And behind this engagement is a big business model. View the larger full-size image(). 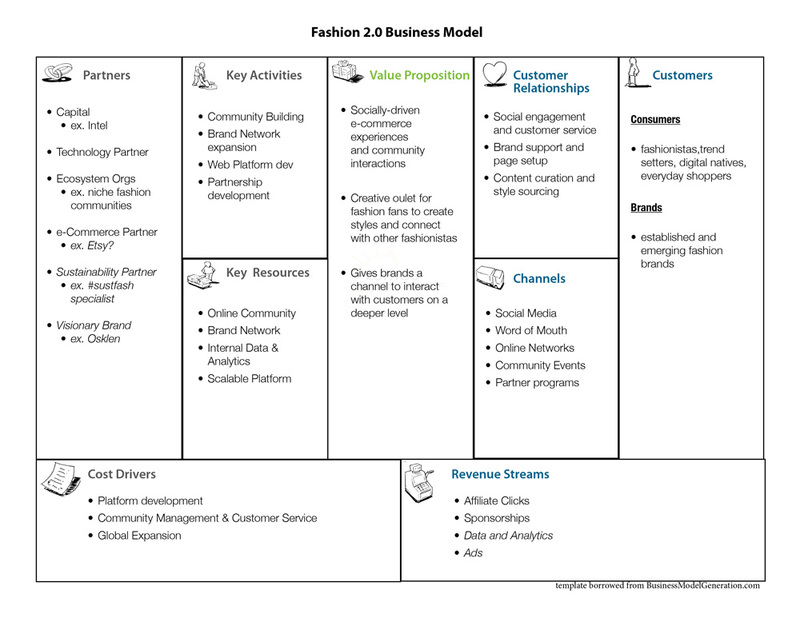 Download the Fashion 2.0 BM Canvas (PDF). To illustrate our point, we will use Fashion.me, the social fashion community that started in Brasil. The company was created by two former investment bankers in 2008; the duo started building an e-commerce clothing website on the weekends for their wives, when they realized how big of a need there was for a site that centralized around user-generated content. Now they are a full-scale startup which recently launched in the US. When users create customized lookbooks, they include a selection of garments from a range of potential fashion brands, big and small. If someone from the community sees a piece of clothing on a community members’ lookbook, they can click on that item and be taken directly to the brand’s website in order to purchase the piece of clothing. In this case, the click will be marked and tracked back to the site where it originated, earning the platform a commission on the sale. Brands can sponsor certain areas of the main community pages in order to have their clothes featured; it’s a way to promote without creating an explicit ad. In this case, Fashion.me has the ‘Look do Dia’ (Look of the Day), which in this particular case is sponsored by e-Closet. The assumption here is that e-Closet has paid to have their clothes featured there, but that is not known 100%. With so much rich interaction happening on the site, the 3rd potential source of revenue will be related to data and analytics. Currently, Fashion.me offers brands the opportunities to create ‘Brand Pages’ for free. As the community grows and user interaction with brands’ content increases, Fashion.me can start to use that data to analyze trending styles, understand user behaviors and forecast future patterns, all of which would be valuable to brands on the site. Polyvore, the US-based equivalent of Fashion.me, incorporates analytics into their site to measure trends about hot products (ie. wide-brimmed hats). While it is unclear whether they would actually sell these analytics to brands, it looks like they are currently using it to increase traffic to top-selling products, which would help increase their affiliate revenues. Finally, we would expect to see advertising become a substantial revenue stream in the future as well. Ideally, they would take the time to develop an advertising-as-content strategy; otherwise the ads will diminish the quality and feel of the site. Polyvore has ads on the side of their website from major brands as soon as you click off the main page. The key for any company operating with the Fashion 2.0 business model is that they focus on enhancing the user experience without making the Facebook mistake – building their business model for corporate interests using advertising – so that the community can continue to grow without users losing trust in the platform. In fashion in particular, there are a lot of big brands with a lot of money to spend who will be keen to jump on board to new sites like this in order build their presence. The risk is the site will become cliché and commercial and develop a consumption-driven community rather than a creation-driven community. Another key is to develop partnerships with entities that have an aligned vision. In Fashion.me’s case, their major partner is Intel. Beyond just the capital injection, Intel can help them move into the US market, which is clearly high on their radar. Intel clearly has an interest in Brazil as well, the 3rd largest PC market in the world and has a highly-connected Internet population. While what Fashion.me and other similar Fashion 2.0 sites are doing is interesting, there is a lot of room to develop it further and bring the impact of the business to a whole new level. What lies beyond for Fashion 2.0? With ‘sustainable’ fashion brands just starting to get the #momo behind them, the next generation of Fashion 2.0 platforms need to start mixing values and ethics into online communities, rather than just style. To make this happen, education needs to be integrated into the platform design, so that users know what to look for (ie. which materials are sustainable) and how to find design-driven brands that make being sustainable stylish. From there, the community can evolve and influential users can use their clout to drive business to up and coming brands and share in the profits. The shifting demographics globally represent a huge opportunity for the first group of communities/platforms who can figure out how to make a custom-tailored Gen Y experience, especially in fashion. Given that our generation is wired to be social, are very values-driven in our purchasing decisions, and will go to great lengths to find brands that can deliver full-spectrum performance, there is a need for new-era platforms that bring a visual, immersive and playful experience to commerce. Beyond just the cliché business trends like ‘gamification’ and ‘social commerce,’ people in our generation are looking for authentic experiences from real brands. Add in the ability to be tribal and connect with the brands that we love, and you have the future of fashion e-commerce for Gen Y. Overall, Fashion 2.0 is an exciting movement that can bring badly-needed creativity and connectedness back to the industry. It’s part of a shift to a more collaborative economy, one that requires new business models and a new view on markets. For those enterprises who understand the ecosystem mentality and can build trusted platforms, the opportunity is massive.